I always have so much fun putting together the games and love sharing them in case you're headed to or hosting an event this season that you want to spice up with some fun. I'm thinking Christmas Eve, work party, NYE, etc. My plan was to start off with a group game pitting team against team. I created this playlist and was going to play the songs through my bluetooth speaker and the first team to shout out the name got one point and the first team to shout out the artist got two points. Easy! Except that my spotify wouldn't work because the WiFi was out. Wah. Wah. On one side of the room I had a table set up with red pom poms and two spoons with a dab of vaseline on them. Participants had to get vaseline on their nose, then get a pom pom to stick to their nose and run to the other side of the room where I had rudolph pictures taped to the wall. They had to get the pom pom to transfer from their nose to the paper (there was a dab of vaseline on the paper as well) and the catch was that they had to do the WHOLE thing without using their hands :) The first person to get the red nose transferred onto Rudolph won. I had one team member from each team come up to the front and I handed them each two rolls of white crepe paper. They had to undo the whole roll without using their hands (for doing anything but holding the rolls). You could also use toilet paper for this one. We had six cups set up in a Christmas tree formation on one side of the room. One team member from each team had to stand behind a designated line and start tossing jingle bells into the cups. We set the timer for one minute and whoever got the most jingle bells into the cups got a point and there was also a point available for getting at least one jingle bell in each cup (filling up the tree). For this game I had two stations set up each with 5 paper plates and 15 empty soda cans. Participants had to create a chandelier stacking in this order... can, plate, 2 cans, plate, 3 cans, plate, 4 cans, plate, 5 cans, plate. Whoever created the chandelier (and it lasted for 3 seconds) first got the point for their team. For this game participants had to get their team to guess as many songs as possible but they could only use the word DOO to sing. I wrote a list of songs on slips of paper and had them in a bowl for teams to draw from. I set the timer for two minutes and each team watched the other team sing/guess. The team that got the most correct won the point for their team. I had 16 Hershey kisses sitting out on a plate for each participant. TWO of the kisses had santa stickers on the bottom. At the same time, players had to pick up a kiss, turn it over and see if it had Santa on it. If it didn't - they had to unwrap and eat the kiss. The first person to get a kiss from Santa won a point for their team. Each player came to the front and they were blindfolded. They each had a bowl full of cotton balls and an empty bowl right next to each other and they had to transfer as many cotton balls as they could in one minute using only a spoon. They had to keep their "non-spoon hand" behind their back. They player who transferred the most snowballs in one minute (or the player who shoveled them all into the other bowl first) won the point. I mean - who doesn't love them some classic pictionary. I had all kinds of Christmas words written out on slips of paper and set the timer for 3 minutes. Each team watched the other team and whoever got their team to guess the most words in 3 minutes won. I had three people from each team come up to the front and the goal was to empty a tissue box with one hand the fastest. You could make this a one vs. one game, but I thought it would be fun to make it more of a team effort. The team who ALL finished first won. I set up 15 plastic cups along the edge of two tables (so 30 cups total) and gave each player a couple of balloons. They had to blow up the balloons and then release the air to blow the cups off of the table. The first one to blow all of their cups off won. This one was super simple - each player had a cup of cocoa and a cup of marshmallows and the first person to finish it all won the point. Amanda tagged me in this video on Facebook and I knew immediately we had to play it. You need a wrapped box, oven mitts and a pair of dice. We had six people (3 from each team) stand around the table and basically you want to be the one to get the gift from inside the box. You have to wear the oven mitTs and you can keep trying to open it until the person next to you rolls doubles at which point you have to pass the box to them. SO fun!!! What were your TOP 2-3 favorite games? I totally want to do this!!! Thanks for sharing, Andrea!!! EEEK! That's so hard to pick! I loved the oven mitt one, pictionary is always a hit and the DOO DOO one was hilarious. The christmas chandelier was awesome as well! SO! MUCH! FUN! I bet some of your peeps get super competitive, which has to be hysterical. Oh my gosh!!! This was SO MUCH FUN!!!!! YAY! I thought so too! We do games every year on Christmas Eve with extended family so I am always on the lookout for new ones. Thanks, Andrea! Perfect! If you end up trying any of them out let me know what you think! I laughed until I cried watching that video. I’ve played that game before without the hat and gloves but where the gift was wrapped in a thousand layers of Saran Wrap. Too much fun!! YES! The saran wrap one is fun as well! 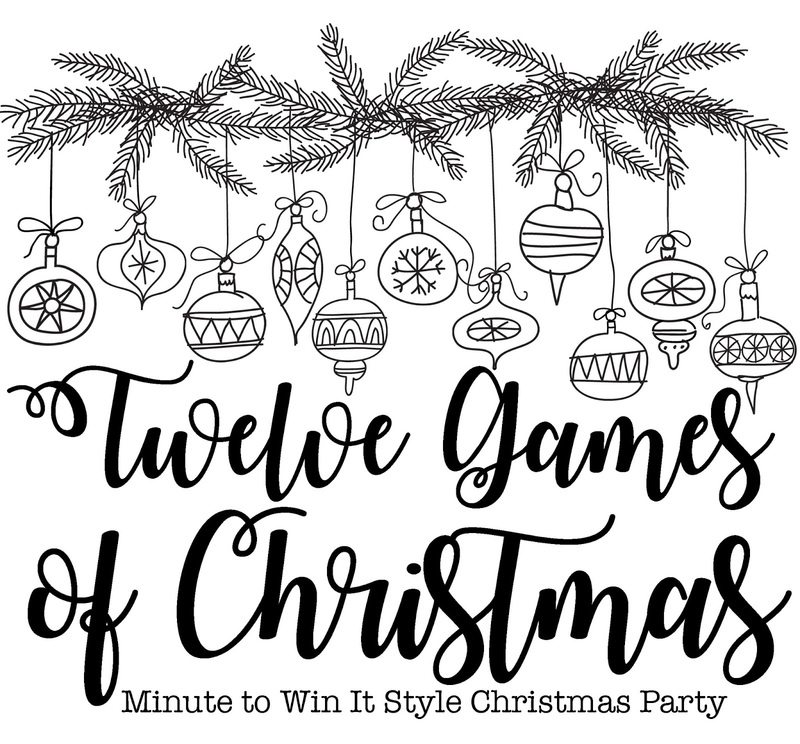 What font was used for: "twelve games of Christmas" page?? Oh gosh! I don't remember - SORRY! Correction:Not page but the title font.